Tundra Swans migrate through Southern Ontario in the spring from their wintering grounds in Chesapeake Bay, Maryland, USA to their breeding grounds in the high Arctic region between Alaska and Baffin Island. 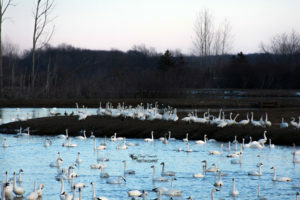 Around 60,000 swans will stop over and refuel at Aylmer Wildlife Management Area on their long journey north. 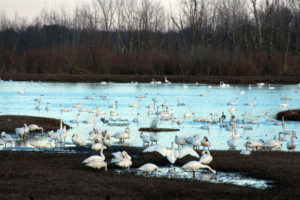 Aylmer Wildlife Management Area is located beside the Ontario Policy College on Hacienda Road in Aylmer, Ontario. There are 25 acres of wetlands that include trails, wildlife viewing stands and plenty of parking. From the parking lot you can access the main viewing platform and wildlife hide which provides an excellent viewpoint of Tundra Pond. 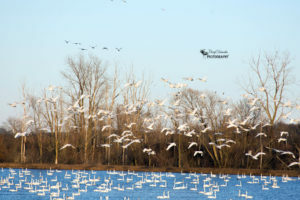 When I visited Aylmer Wildlife Management Area to view the Tundra Swans I did not know what to expect and as I pulled into the parking lot in front of the viewing stands I got really excited at what was in front of me. I quickly got my camera ready and decided to go to viewing platform 1 which is the farthest to the left of the parking lot in front of Tundra Pond. As I reached the top of the stairs and got my first glimpse of the Tundra Swans I was blown away by how many birds there were and how loud they sounded. I started taking photos as my focus was being pulled in all different directions while swans took off and came in for landing. There were also Canada Geese and other waterfowl at the pond and I was able to capture a group of geese taking flight from the water. 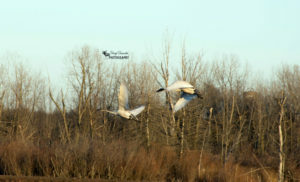 I hope you enjoy my pictures of the Tundra Swans below. Please feel free to follow, comment, like and share. 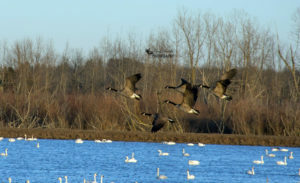 This entry was posted in Nature Photography, Wildlife Photography and tagged aylmer, aylmer wildlife management area, birds, Camera, canada geese, nature, nature photography, Nikon, Nikon D7200, ontario, outdoors, outside, Photo, Photography, tundra swan, wildlife, wildlife photography.